A warm and friendly elderly person is offering a good-sized bedroom in exchange for about 10 hours of practical help per week plus 5 hours of companionship. As the elderly person has limited mobility, this opportunity would suit someone who ideally works or studies part-time from home and would be able to give support and companionship, not just at evenings and weekends, but also some during the day as well. Looking for a sociable character who enjoys company, conversation and having a cup of tea together. The person would appreciate the security of someone sleeping in the house at night, generally helping around the house, a little shopping, and who enjoys cooking including meat and fish and eats supper at home most evenings. The person has a cleaner but you would be required to keep your own room clean and tidy and keep the kitchen and bathroom clean after use and give a little help in the garden. 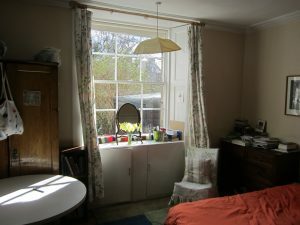 The property is conveniently located just a 20-minute walk from Edinburgh University. This opportunity is for a female non-smoker. If you are interested, please email your contact details and a little information about yourself including your work/study commitments, why you are interested in this Share and your own hobbies, interests, cooking ability/style and availability. We can then tell you more about the situation.